Polyester outer with 220gsm poly cotton fill. 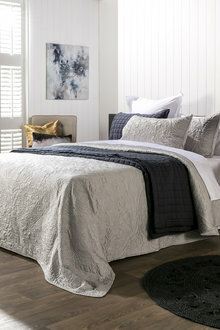 Luxurious and stylish bedding is effortless with the Emblem Bedcover Set, a modern, understated yet glamourous essential. Available in chic silver and crafted in a durable but not too heavy polyester with polycotton fill; this timeless bedcover will have your room looking and feeling like heaven. A versatile design, this bedcover will allows for use in a range of decor schemes, enhancing your home and ensuring a comfortable and fashionable finish.